The Ly-49 multigene receptor family regulates mouse NK cell functions. A number of Ly-49 genes exhibit allelic variation, but the functional significance of allelic differences in extracellular domains of Ly-49 receptors regarding ligand specificity is largely unknown. Amino acid differences exist in the extracellular domains of the B6 and BALB/c allele products of the inhibitory Ly-49G receptor. We constructed chimeric Ly-49 receptors consisting of common cytoplasmic and transmembrane regions of the activating Ly-49W receptor fused with the ectodomains of the B6 and BALB/c alleles of Ly-49G. Expression of these chimeras in the RNK-16 rat NK cell line allowed us to study the specificity of inhibitory receptor ectodomains as they stimulated NK lytic activity. We found that the ectodomain of the BALB/c allele of Ly-49G recognizes both H-2Dd and Dk class I MHC alleles, whereas the ectodomain of the B6 allele of Ly-49G recognizes Dd, and not Dk. The specificity for Dk as well as Dd of the wild-type Ly-49GBALB/c allele product was confirmed with RNK-16 transfectants of this inhibitory receptor. Furthermore, the ectodomain of the Ly-49GBALB/c allele recognizes a distinct repertoire of xenogeneic ligands that only partially overlaps with that recognized by Ly-49GB6. Our results indicate that allelic variation in Ly-49 extracellular domains can have functional significance by altering Ly-49 receptor specificity for mouse class I MHC and xenogeneic ligands. Natural killer cells are mediators of innate immune responses against transformed or virally infected cells (1, 2). NK cells can also recognize allogeneic cells which may be important in bone marrow rejection (3, 4). NK cells express a variety of inhibitory receptors specific for classical (class Ia) and nonclassical (class Ib) MHC-encoded molecules (1). Regulation of NK activities can be explained in part by the “missing self” hypothesis (5). For example, NK inhibitory receptors engaged by levels of class I MHC proteins found on healthy cells prevent NK activation, whereas pathologically altered cells deficient in class I expression are not protected by this mechanism. In the mouse, inhibitory receptors specific for class Ia MHC molecules are encoded by the Ly-49 multigene family, which consists of many closely related genes located in the NK gene complex on chromosome 6 (6, 7). Ly-49 receptors are type II transmembrane proteins that form disulfide-bonded homodimers (8). Inhibitory Ly-49 molecules contain an immunoreceptor tyrosine-based inhibitory motif (ITIM)3 in their cytoplasmic tail that becomes phosphorylated on tyrosine upon receptor engagement (9). This event recruits and activates the Src homology 2 domain-containing tyrosine phosphatase-1, which disrupts membrane proximal signaling relevant to NK activation (9). Other Ly-49 family members lack the ITIM and instead contain a charged residue in the transmembrane segment for association with the immunoreceptor tyrosine-based activating motif (ITAM)-containing signaling adapter protein DAP12 (10, 11). Engagement of DAP12-associated Ly-49 receptors leads to tyrosine kinase (Syk or Zap-70) -dependent NK cell activation (11). Ly-49 receptors are allele specific in their recognition of class I ligands and are functionally, although not structurally, equivalent to killer Ig-like receptors of human NK cells (1). The inhibitory Ly-49A and Ly-49G receptors prevent NK cytolytic activity upon recognizing H-2Dd (7, 12). Activating Ly-49 receptors D, P, and W are also class I allele specific in their recognition (13, 14, 15), whereas class I recognition by Ly-49H, another activating receptor, has not been demonstrated. Ly-49D recognizes xenogeneic ligands of rat and hamster (16, 17), while Ly-49H has a role in resistance to mouse CMV, possibly through its recently demonstrated recognition of the mouse CMV-encoded m157 molecule (18, 19, 20, 21). Many Ly-49 genes, including Ly-49A and Ly-49G, exhibit allelic variation between mouse strains (14, 15, 22, 23). Most residues differing between Ly-49 alleles are in the extracellular stalk and carbohydrate recognition domains (CRD), possibly affecting ligand specificity. In this study, we demonstrate that ectodomains of Ly-49G C57BL/6 (B6) and BALB/c alleles differ in their ligand specificities. The B6 and BALB/c alleles of Ly-49G both recognize H-2Dd, but only the BALB/c allele recognizes a different class I molecule, H-2Dk. Furthermore, the ectodomain of the Ly-49GBALB/c allele exhibits a distinct and only partially overlapping pattern of xenogeneic ligand recognition with the Ly-49GB6 allele. Thus, our results indicate that allelic variation in Ly-49 ectodomains can alter receptor specificity for mouse class I MHC molecules and xenogeneic ligands. Five- to 8-wk-old female C57BL/6, BALB/c, DBA/2, CBA/J, C57BL/10 (B10), B10.D2-H2d/nSn (B10.D2), and B10.BR mice were purchased from The Jackson Laboratory (Bar Harbor, ME). Six-week-old DA, AO, F344, LEW, LOU, and PVG rats were purchased from Harlan Sprague Dawley (Indianapolis, IN) and Harlan Olac (Bicester, U.K.). Experiments met the approval of the Animal Welfare and Policy Committee of the University of Alberta (Edmonton, Alberta, Canada). The following Abs were produced from hybridomas obtained from American Type Culture Collection (Manassas, VA), except Cwy-3, which was generated in this laboratory: 4D11 (rat IgG2a), anti-Ly-49G (12); Cwy-3 (IgG1), anti-Ly-49G (24); M1/42 (rat IgG2a), anti-mouse class I MHC (25) and Y13–238, anti p21ras (26). Abs were prepared from NH4SO4 precipitates as described (14). Purified OX-8 (IgG1) anti-rat CD8α was purchased from BD PharMingen (San Diego, CA). FITC-coupled mouse anti-rat IgG was purchased from Jackson ImmunoResearch Laboratories (West Grove, PA). RNK-16, a spontaneous F344 rat strain NK cell leukemia cell line (9), was provided by Dr. M. Nakamura at the University of California (San Francisco, CA). The RNK-16 cells were maintained in RPMI 1640 supplemented with 10% FCS, l-glutamine, penicillin, streptomycin, and 5 × 10−5 M 2-ME. YB2/0, a nonsecreting rat myeloma, was obtained from American Type Culture Collection. The Chinese hamster ovary (CHO) cell line was a gift from Dr. G. Armstrong at the University of Alberta. The YB2/0 and CHO cell lines were maintained in RPMI 1640 supplemented with 10% FCS, l-glutamine, penicillin, streptomycin, and 1 mM sodium pyruvate. The cDNAs encoding B6 and BALB/c Ly-49G2 alleles were prepared by RT-PCR from total RNA obtained from IL-2-activated NK cells, as described for cloning the nonobese diabetic allele of Ly-49G (15). The cDNAs containing the coding regions for the wild-type Ly-49G2 alleles were inserted into the XbaI-XhoI sites of the mammalian expression vector BSRαEN (provided by Dr. A. Shaw, Washington University, St. Louis, MO). To create the chimeric receptors, a BstEII restriction site was silently introduced by site-specific mutagenesis at the boundary between the transmembrane and extracellular domains of both Ly-49W2 and Ly-49G2 cDNAs. The XhoI/BstEII fragment of Ly-49W2 and the BstEII/XbaI fragment of Ly-49G2 were simultaneously inserted into BSRαEN at the XhoI-XbaI sites to create BSR.Ly-49WGB6 and BSR.Ly-49WGBALB/c. RNK-16 cells were stably transfected with individual constructs as previously described (15). A cDNA encoding H-2Dk was cloned by RT-PCR from the RDM4 cell line. The Dk cDNA we cloned encodes a mature Dk protein identical to that previously reported (27). A cDNA encoding H-2Ld was cloned by RT-PCR from IL-2-activated BALB/c NK cells and it encodes a mature Ld protein identical to that previously reported (28). The coding sequence for H-2Dk, Dd, or Ld was inserted into the expression vector pCI-neo (Promega, Madison, WI) and transfected into YB2/0 as described (14). 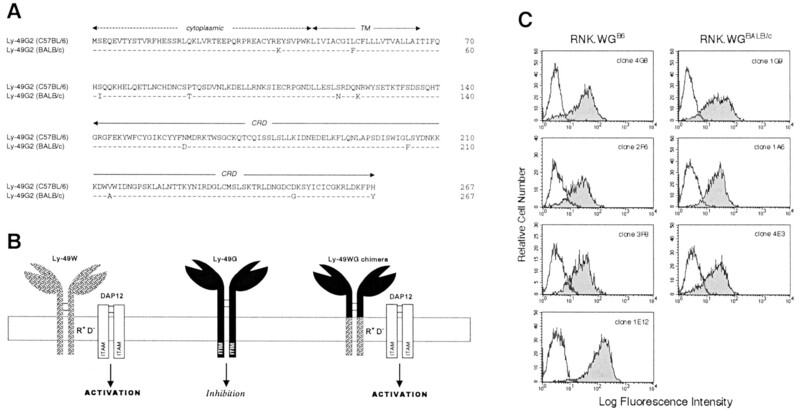 Expression of Ly-49WG chimeric or full-length Ly-49G allelic receptors on RNK-16 transfectant clones was measured by FACS analysis with the 4D11 mAb after blocking FcR with normal mouse serum. The secondary Ab was FITC-labeled mouse anti-rat IgG. Samples were analyzed on a FACScan flow cytometer (BD Biosciences, Mountain View, CA). Con A-activated T cell blasts were prepared from spleens of various mouse and rat strains. Fifteen million spleen cells were cultured at 5 × 106 cells/ml in RPMI 1640 with 10% heat-inactivated FCS, 2-ME, and 3 μg/ml Con A (Sigma-Aldrich, St. Louis, MO) for 48 h. Blast cells were recovered after washing in RPMI 1640 medium. Target cells were labeled at 37°C with 100–150 μCi of Na51CrO4 (51Cr) (Mandel, Guelph, Canada); YB2/0, YB2/0 transfectants and CHO cells were labeled for 1 h. The Con A blasts were labeled for 1.5 h. Following extensive washes, 1 × 104 51Cr-labeled cells were incubated with RNK.WG or RNK.49G effector cells for 4 h at 37°C in V-bottom microtiter plates at various E:T ratios in triplicate. After incubation, supernatant samples were counted in a MicroBeta TriLux liquid scintillation counter (PerkinElmer, Wellesley, MA). Percent specific lysis was determined as (experimental release − spontaneous release)/(maximum release − spontaneous release) × 100. In Ab inhibition experiments, mAbs were incubated for 30 min with 1 μg of soluble protein A and G (PA/PG)(Calbiochem, La Jolla, CA) for each microgram of mAb, then added to effector cells for 15 min before the cytotoxicity assay to prevent reverse Ab-dependent cell-mediated cytotoxicity (ADCC) as described (15). The mAbs and PA/PG were present throughout the cytotoxicity assays. To perform the reverse ADCC assays, RNK.Ly-49WGB6 and RNK.Ly-49WGBALB/c effector cell clones were preincubated for 15 min with 10 μg/ml of the 4D11 mAb before addition of FcR-expressing YB2/0 target cells and subsequent 4-h cytotoxicity, as described (14). Background lysis of YB2/0 cells was subtracted in assays of each RNK.WG effector cell clone to obtain the maximal specific lysis by reverse ADCC and Dd-specific cytotoxicity of YB2/0.Dd target cells, for the determination of the percentage of maximal lysis inducible by the Dd ligand. All cytotoxicity experiments were performed a minimum of three separate times. The ligand specificity of Ly-49GB6 has been examined by Ab blocking in NK cell assays using the 4D11 Ab and by protein binding with class I MHC tetramers (12, 29). Results from these studies suggest that Ly-49GB6 recognizes H-2Dd, although perhaps less strongly than Ly-49A does (29). Complementary DNA sequences cloned from CB.17, BALB/c, nonobese diabetic/nonobese diabetes-resistant, and 129/J strains have nucleotide identities of 98% or greater when compared with Ly-49G from the B6 strain and have been designated alleles of Ly-49G (12, 15, 30). In addition, Ly-49GBALB/c is <87% identical to other Ly-49 family members cloned from the B6 mouse, giving additional support to the BALB/c sequence being an allelic form of Ly-49G and not another member of the Ly-49 family. We cloned cDNAs encoding the B6 and BALB/c Ly-49G2 alleles by RT-PCR from IL-2-activated B6 and BALB/c NK cells and they are identical to those cloned earlier from B6 and CB.17 mice, respectively (12, 31). The extracellular domains of Ly-49GB6 and Ly-49GBALB/c differ at nine amino acid positions; four in the membrane proximal stalk region and five in the membrane distal CRD (Fig. 1⇓A). Only two other amino acids differ between B6 and BALB/c alleles, one in the transmembrane segment and one in the cytoplasmic tail (Fig. 1⇓A). Construction and expression of activating Ly-49 receptors with the extracellular domain of the inhibitory receptor Ly-49G2. A, Protein sequence alignment of Ly-49G B6 and BALB/c alleles. B, Ly-49W cytoplasmic/transmembrane domains fused to the ectodomain of B6 or BALB/c Ly-49G create Ly-49WG chimeric receptors. C, RNK-16 transfectant clones stably expressing Ly-49WG (RNK.WG) stained with the 4D11 (filled histogram) or isotype control M1/42 (open histogram) mAb. Amino acid differences in the extracellular domains of Ly-49GB6 and Ly-49GBALB/c prompted us to determine whether their ligand specificities differ. Complications are associated with attempting to define specificities of individual Ly-49 receptors using NK cells. NK cells are highly heterogeneous regarding the number of distinct Ly-49 receptors expressed, and as we and others have shown, most (if not all) Abs originally thought to be specific for individual Ly-49 proteins cross-react with other Ly-49 molecules (14, 15, 30). Such complications can be avoided by expressing individual mouse Ly-49s on the heterologous rat NK cell line, RNK-16 (9). To examine the specific contribution of Ly-49G allele ectodomains to receptor specificity, we used chimeric receptors. External domains of B6 and BALB/c alleles of Ly-49G were fused to a common cytoplasmic/transmembrane portion of the activating Ly-49W receptor (Fig. 1⇑B), creating activating receptors with the specificity of inhibitory Ly-49G proteins. An advantage of using chimeric receptors is that the functional specificity of an inhibitory receptor ectodomain can be determined directly in a positive NK response, as opposed to previous approaches reliant on Ab reversal of receptor-dependent inhibition of undefined activating receptor function. Chimeric Ly-49WG constructs were stably transfected into RNK-16 cells. 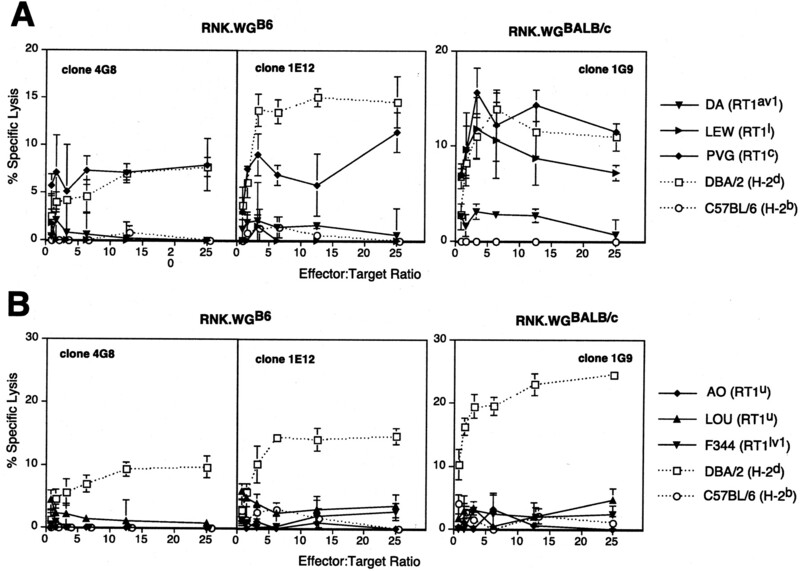 Three clones each of the RNK.WGB6 and RNK.WGBALB/c transfectants with matching expression levels, as determined by the B6 and BALB/c Ly-49G cross-reactive Ab, 4D11, were selected for study (Fig. 1⇑C). Additionally, an RNK.WGB6 clone expressing ∼3-fold higher levels of Ly-49WGB6 (Fig. 1⇑C) was used in some comparisons with the RNK.WGBALB/c transfectants. Lysis of Con A-activated T cell blasts from DBA/2, CBA/J, and C57BL/6 mice by the RNK.WG transfectants was determined. RNK.WGB6 recognizes DBA/2 (H-2d) Con A blasts (Fig. 2⇓A), consistent with previous studies indicating that Ly-49GB6 recognizes H-2Dd (12, 32). RNK.WGBALB/c also recognizes DBA/2 Con A blasts (Fig. 2⇓A). In addition, we consistently observed stronger recognition with RNK.WGBALB/c over RNK.WGB6 with multiple clones having matched levels of Ly-49WG expression, e.g. clone 4G8B6 and 1G9BALB/c (Fig. 2⇓A and data not shown). These results may indicate that Ly-49GBALB/c has a higher affinity than Ly-49GB6 for H-2d ligand(s) and/or other DBA/2 ligands. We also find that RNK.WGBALB/c displays equally effective recognition of CBA/J and DBA/2 Con A blasts (Fig. 2⇓A). This is in striking contrast to RNK.WGB6, which even with increased Ly-49WG expression, e.g. clone 1E12, shows very little or no recognition of CBA blasts (Fig. 2⇓A). These results suggest that Ly-49GBALB/c recognizes one or more CBA-expressed ligands, possibly H-2k-encoded, while Ly-49GB6 does not. Neither chimeric receptor mediated lysis of B6 Con A blasts (Fig. 2⇓A), which is consistent with previous studies of Ly-49GB6 specificity (12, 29). Untransfected RNK-16 did not lyse any of the Con A blasts (data not shown and Ref. 15). B6 and BALB/c Ly-49G chimeric receptors differ in their specificities for mouse class I MHC ligands. RNK.WGB6 and RNK.WGBALB/c were tested in 4-h cytotoxicity assays, at the indicated E:T ratios, against DBA/2, CBA/J, and C57BL/6 Con A blasts (A), B10, B10.D2, and B10.BR Con A blasts (B), YB2/0, YB2/0 H-2Dd, or H-2Dk transfectants (C), or YB2/0 H-2Dd transfectants at a 25:1 E:T ratio, and YB2/0 cells in reverse ADCC following incubation of the indicated effector cells with 10 μg/ml of 4D11 mAb at the same E:T ratio (D). Data represent the mean of triplicate wells ± SD (A–C), or the percentage of maximal lysis by reverse ADCC using YB2/0 targets, achieved with Dd-transfected YB2/0 targets determined from triplicate determinations (D). To determine whether H-2k MHC molecule(s) are recognized by Ly-49WGBALB/c and not by the WGB6 chimera, we examined lysis of B10 congenic T cell blasts, differing only in their MHC haplotype, by B6 and BALB/c Ly-49WG chimeric receptor transfectants matched for receptor expression. Because substantial and comparable cytotoxicity was observed with B10.D2 and B10.BR, but not B10 targets, we conclude that the BALB/c Ly-49G ectodomain recognizes allogeneic H-2k as well as syngeneic H-2d ligand(s) (Fig. 2⇑B). In contrast, only the H-2d-expressing B10.D2 target was recognized by the Ly-49WGB6 chimera (Fig. 2⇑B). To identify specific MHC class I ligands that may be recognized by the Ly-49G ectodomains, we expressed H-2Dd and H-2Dk in rat YB2/0 cells. 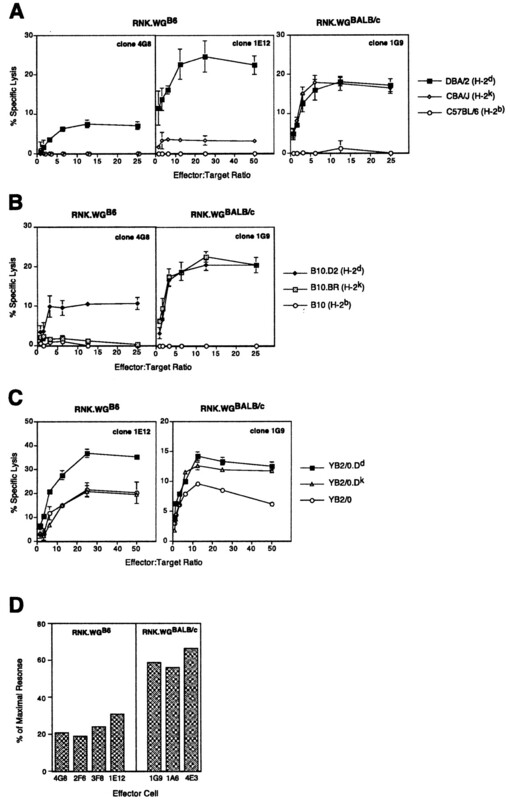 Although RNK-16 cells can lyse YB2/0 at moderate levels, augmented killing of YB2/0 mouse class I MHC transfectants indicates class I specificity of mouse activating Ly-49 receptor transfectants of RNK-16 cells (13, 15). Our results confirm that Ly-49WGB6 recognizes H-2Dd but not H-2Dk, while Ly-49WGBALB/c recognizes H-2Dd and H-2Dk (Fig. 2⇑C). Enhanced lysis is not observed against mouse class I-transfected YB2/0, compared with untransfected YB2/0 using untransfected RNK-16 (data not shown). Our results indicate that the B6 and BALB/c Ly-49G ectodomains have a common ligand, Dd, although when matched for Ly-49WG chimera surface expression, more cytotoxicity of H-2d targets can be observed with the BALB/c chimera (Fig. 2⇑, A and B). We attempted to assess potential quantitative differences in Dd recognition between the two chimeric receptors and standardize cytotoxicity results to minimize effects of clonal variability in this analysis. This was approached by comparing individual WGB6 and WGBALB/c chimera-transfected RNK clones for lysis of YB2/0.Dd targets, relative to maximal lysis obtainable through the respective WG receptors in reverse ADCC using YB2/0 targets and the 4D11 Ab, which recognizes both Ly-49G allele ectodomains. All of the Ly-49WGBALB/c clones were substantially more effective than the WGB6 clones at lysing the Dd-expressing target, relative to the maximal lysis achievable by reverse ADCC for each clone (Fig. 2⇑D). The BALB/c chimera clones achieved 59–65% of maximal lysis via the receptor in recognizing Dd, whereas none of the B6 chimeras exceeded 31% of maximal response and most achieved 24% or less, in recognizing Dd (Fig. 2⇑D). These results suggest that the Ly-49GBALB/c ectodomain recognizes Dd quite well and more effectively than the ectodomain of Ly-49GB6, which even in this standardized analysis recognizes Dd relatively poorly. These differences in recognition may suggest differences in affinity of the ectodomains of the two Ly-49G alleles for Dd. We verified that specificity for mouse class I MHC ligands is conferred by the chimeric mouse Ly-49 receptors expressed by the RNK effectors. Abs recognizing the B6 (Cwy-3) or BALB/c (4D11) Ly-49G ectodomains completely or very substantially blocked recognition of DBA/2 (H-2d) or CBA (H-2k) targets by the Ly-49WGB6 and Ly-49WGBALB/c-expressing RNK-16 effector cells, respectively (Fig. 3⇓). We conclude from the foregoing experiments that the ectodomains of two allelic forms of Ly-49G differ in their specificities for mouse class I MHC ligands. Lysis of DBA/2 Con A blasts mediated by the WGB6 Ly-49G chimeric receptor and lysis of CBA/J blasts mediated by the WGBALB/c chimeric receptor is blocked by Cwy-3 (anti-Ly-49GB6-specific) and 4D11 (pan Ly-49G-specific) Abs, respectively. Lysis of DBA/2 Con A blasts by RNK.WGB6 clone 1E12, or CBA Con A blasts by RNK.WGBALB/c clone 1G9, was measured with no Ab or in the presence of anti-Ly-49G Ab (Cwy-3 or 4D11, respectively) or control Abs (OX-8 or Y13–238, respectively), at the indicated concentrations. Abs were preincubated with 1 μg of PA/PG per microgram of Ab for 30 min before they were added to effector cells for 15 min. Subsequent cytotoxicity was determined at an E:T ratio of 12.5:1 in 4-h 51Cr-release assays. Data represent the mean of triplicate wells ± SD. We went on to determine whether wild-type inhibitory B6 and BALB/c Ly-49G allele products could corroborate our observations with the chimeric Ly-49 receptors. To this end, we expressed each Ly-49G allele product in RNK-16 cells and examined cytotoxicity by these effector cells against YB2/0 cells or YB2/0 cells transfected with H-2Dd, Dk or another class I molecule, Ld, which may be a Ly-49G ligand (12) (Fig. 4⇓). Three clones expressing each Ly-49G allele were compared. Very modest inhibition of cytolysis of the H-2Dd-expressing target was observed with one RNK.GB6 clone, 1B6, and the other two such clones, 5D10 and 6A1, were not inhibited by Dd (Fig. 4⇓A). All three RNK.GB6 clones were not inhibited by target cell H-2Dk expression (Fig. 4⇓A). In contrast, inhibition of cytolysis was readily detected and nearly complete with targets expressing Dd or Dk, using all three RNK.GBALB/c effector cell clones (Fig. 4⇓B). The expression of Ld showed a consistent, but generally very modest inhibition of lysis by the RNK.GB6 effector cells, whereas a somewhat stronger, although still mostly partial, inhibition is observed with all RNK.GBALB/c effector cells. All target cells were lysed equally well by untransfected RNK-16 cells (data not shown). The wild-type Ly-49GBALB/c allele product clearly demonstrated the same Dd and Dk class I MHC interaction as the chimeric Ly-49WGBALB/c receptor and confirmed these specificities of this Ly-49G allele. The relative insensitivity of the wild-type Ly-49GB6 allele to expression of the H-2Dd product is consistent with a previous report that this allele has only very weak interactions with H-2d-expressing cells or H-2Dd and H-2Ld tetramers (29). Therefore, Ly-49GB6 specificity for Dd in the form of an inhibitory receptor may not be readily detectable using the RNK system. However, the class I MHC specificity of the chimeric Ly-49WGB6-activating receptor does indicate Dd recognition and this is in agreement with the specificity suspected for Ly-49G expressed on NK cells (12). The difference in the extent of Dd recognition by the wild-type Ly-49GB6 as opposed to its chimeric receptor may be that a somewhat greater sensitivity is obtainable with the activating form of the receptor. No evidence is found for Dk recognition by the Ly-49GB6 allele in either form of the receptor. The BALB/c allele, but not the B6 allele of Ly-49G, strongly inhibits RNK-16-mediated lysis of H-2Dd and H-2Dk-expressing target cells. RNK-16 cells transfected with the C57BL/6 allele of Ly-49G, clones 1B6, 5D10 and 6A1 (A), or the BALB/c allele of Ly-49G, clones 1B12, 2B10 and 1D10 (B), were examined for Ly-49G expression and lysis of YB2/0 cells or YB2/0 cells transfected with mouse H-2Dd, Dk, or Ld. RNK-16 transfectants were stained with 4D11 (filled histograms) and in some cases, an isotype control M1/42 to determine background staining (open histograms). Lysis was determined in standard 4-h cytotoxicity assays using the indicated E:T ratios. Data represent the mean of triplicate wells ± SD. In addition to recognizing Dd, the activating mouse Ly-49D receptor can stimulate NK-mediated lysis by recognizing undefined xenogeneic ligands expressed on certain hamster and rat targets (16). For example, Ly-49D does not recognize a ligand from Syrian hamsters but does recognize a ligand from Chinese hamsters, as evidenced by lysis of CHO cells (16). Our results show that CHO cells are also recognized by the BALB/c allele of Ly-49G, with all three clones expressing the Ly-49WGBALB/c chimeric receptor demonstrating substantial CHO cytotoxicity (Fig. 5⇓A). In contrast, three clones expressing equivalent levels of the Ly-49WGB6 chimeric receptor showed no lysis of CHO targets (Fig. 5⇓A). Even when the Ly-49WGB6 chimeric receptor is expressed at higher levels, such as with clone 1E12, CHO cells are not recognized despite significant lysis of DBA/2 blasts in the same assays (Fig. 5⇓B). These results prompted examination of Ly-49G allele recognition of rat xenogeneic ligands. Con A blasts of the PVG strain were lysed by RNK.WGB6 and RNK.WGBALB/c effector cells, indicating that ectodomains of either Ly-49G allele are able to recognize a rat ligand (Fig. 6⇓A). RNK cells expressing the Ly-49WGBALB/c chimera lysed LEW strain Con A blasts, whereas those expressing the Ly-49WGB6 chimera were unable to do so (Fig. 6⇓A), suggesting another difference in the specificities of the two Ly-49G alleles. T cell blasts from several other rat strains, including AO, LOU, DA, and F344, were not recognized by either Ly-49G allele, despite significant recognition of DBA/2 Con A blasts in the same assays (Fig. 6⇓B). No lysis of CHO or rat blasts was observed with RNK-16 cells (data not shown). Thus, B6 and BALB/c ectodomains of Ly-49G differ not only in recognition of mouse class I MHC, but also in xenogeneic hamster and rat ligands. The ectodomain of the BALB/c but not the B6 allele of Ly-49G recognizes the xenogeneic CHO hamster target cell. Three clones each of RNK.WGB6 and RNK.WGBALB/c matched for receptor expression level were tested for cytotoxicity against CHO cells (A). 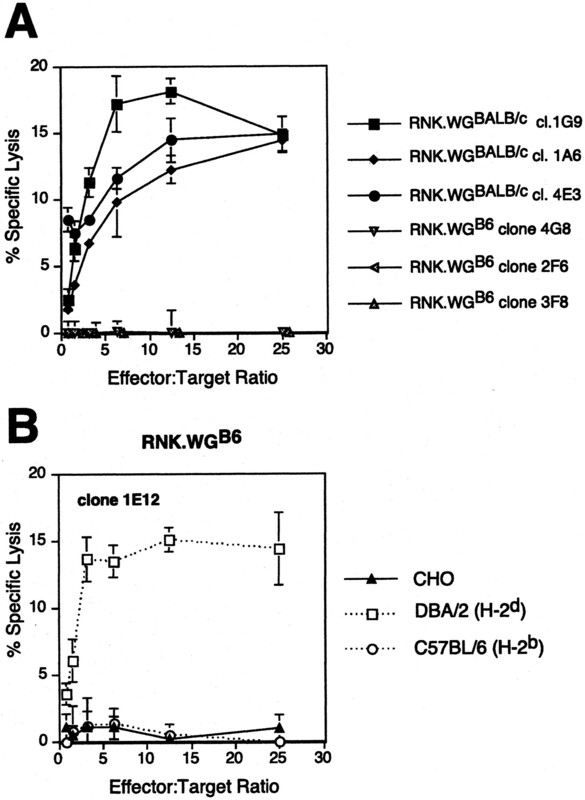 The RNK.WGB6 clone 1E12 expressing high levels of the WGB6 receptor was also tested for cytotoxicity against CHO cells as well as DBA/2 and B6 Con A blasts (B). Effector cells were incubated with target cells in standard 4-h cytotoxicity assays at the indicated E:T ratios. All data represent the mean of triplicate wells ± SD. The B6 and BALB/c Ly-49G ectodomains exhibit only partially overlapping specificities for rat ligands. The RNK.WGB6 clones 4G8 and 1E12, and RNK.WGBALB/c clone 1G9 were used as effector cells against Con A T cell blasts generated from splenocytes of various rat strains; DA, LEW, and PVG (A), or AO, LOU, and F344 (B), with mouse DBA/2 and C57BL/6 Con A blasts used as positive and negative controls, respectively (A and B). Standard 4-h cytotoxicity assays were performed at the indicated E:T ratios. All data represent the mean of triplicate wells ± SD. A number of Ly-49 genes including Ly-49A, C, and G demonstrate allelic variation (14, 15, 22, 23, 33). When allelic differences occur in extracellular ligand-binding regions, there is the possibility that the affinity, specificity, or both, of Ly-49 ligand binding could be affected. The first study attempting to address this question compared B6 and BALB/c alleles of Ly-49C and found no difference in class I binding specificity (29). These two alleles have only one variance in the CRD, a rather conservative difference of Phe vs Tyr, and thus would very likely have identical ligand specificities. Another report by Mehta et al. (22) provided evidence for variability in the affinity of different Ly-49A alleles for H-2Dd through quantitative differences in Dd tetramer binding to Ly-49A alleles expressed by transfection on CHO cells. They observed partial or no inhibition of NK lysis mediated by Dd with Ly-49A+ NK cells, defined by Ab staining, from BALB/c and SWR strain mice, respectively. In contrast, complete inhibition was observed with such NK cells from two other mouse strains. Such results suggest a hierarchy of Ly-49A allelic interaction with Dd and are consistent with our findings where the BALB/c allele of Ly-49G appears to recognize Dd more efficiently than the B6 allele. However, more importantly, we found that the ectodomain of the BALB/c Ly-49G allele confers the gain of specificity for another class I ligand, H-2Dk, as well as conferring recognition of a distinct and only partially overlapping repertoire of xenogeneic ligands compared with the B6 allele. The recognition of another ligand, mouse Ld, by Ly-49G is somewhat controversial, being observed in some experimental systems (12, 34), but not others (29, 35). In our experiments, Ld was recognized relatively weakly by both Ly-49G allele products and the limited extent of interaction could explain why its recognition by Ly-49G is observed in some experimental systems but not others. In any event, Ld was not a discriminating ligand between the Ly-49G allele products. 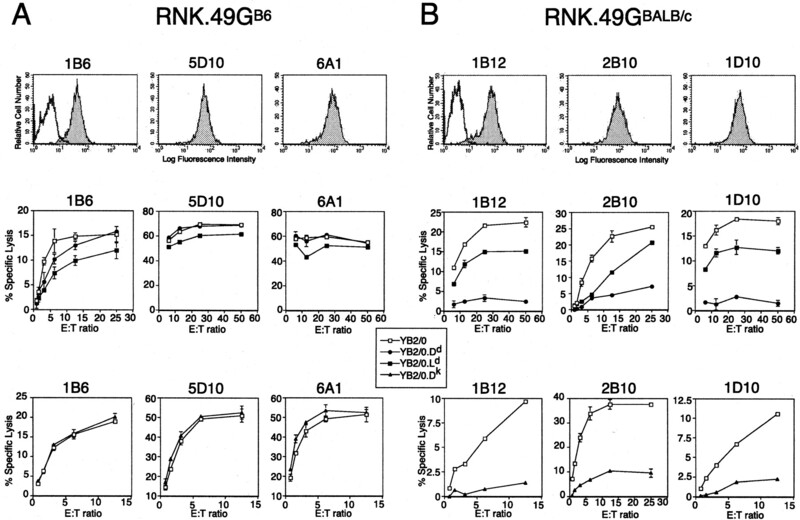 A potential limitation of studies using NK subsets defined by Ab staining to determine the specificity of individual Ly-49 receptors is the substantial complication of Ab cross-reactivity with other Ly-49 receptors, defined or undefined, that may be expressed on the NK cells being examined. Differences in ligand specificity between the BALB/c and B6 alleles of Ly-49G, identified in this study, can be directly attributed to differences in their ectodomains, because our tests included transfection of individual chimeric Ly-49 constructs which limited receptor variation to the Ly-49G extracellular domains. Because our studies principally used chimeric receptors, there is the potential that specificities of intact Ly-49G alleles could be different from those we have identified, due to polymorphism in the transmembrane segment/cytoplasmic tail, or in using an activating as opposed to inhibiting form of the receptor. When we expressed the wild-type BALB/c allele of Ly-49G in RNK-16, it was found to have the same pattern of MHC recognition as the WGBALB/c chimeric receptor, with strong inhibition of RNK-16-mediated cytotoxicity against targets expressing H-2Dd and H-2Dk being observed. In contrast, RNK-16 transfected with the B6 allele of Ly-49G exhibited relatively unaltered killing of H-2Dd- or Dk-expressing target cells. As we have indicated, the B6 Ly-49G allele was previously reported to have only weak interactions with H-2d targets or H-2Dd tetramers and no interactions with H-2k-expressing cells or H-2Dk tetramers (29). It is possible that its specificity in the form of an inhibitory receptor may not be readily detectable using the RNK system. However, the specificity of the chimeric Ly-49WGB6-activating receptor does agree with wild-type Ly-49GB6 expressing mouse NK cells and Ly-49GB6 transfectants (12, 29), perhaps due to somewhat greater sensitivity obtained using the chimeric-activating receptor. We compared the Ly-49WGBALB/c and B6 chimeras for efficiency of lysis induction of Dd-expressing targets relative to that stimulated through the receptors by reverse ADCC. Our results suggest that although the Ly-49GB6 ectodomain recognizes Dd, it does so relatively poorly in comparison to the ectodomain of Ly-49GBALB/c. The reduced recognition is consistent with a low affinity of the Ly-49GB6 ectodomain for Dd, in agreement with previous reports. The lower affinity may help to explain our relative difficulty in observing significant inhibition of lysis mediated by Ly-49GB6 using RNK-16 transfectants that are readily observable with the Ly-49GBALB/c RNK-16 transfectants. The influence of the two amino acid residues, one in the transmembrane segment, and one in the cytoplasmic tail, that differ between B6 and BALB/c Ly-49G alleles, on receptor specificity or function were not investigated in this study. We consider it unlikely that they will have a significant impact on receptor specificity or function. The former is a conservative change and the latter, although a nonconservative change, occurs at a substantial distance from the ITIM sequence (Fig. 1⇑A). The cocrystal of Ly-49A bound with Dd may serve as a model for Ly-49-class I MHC interactions (36). Two independent sites of Ly-49A interaction on Dd were identified: site 1 at the N terminus of the α1 helix and C terminus of the α2 helix, and site 2 in the cleft formed by the α1/α2 domains, the conserved α3 domain and β2-microglobulin (Fig. 7⇓). Of CRD residues differing between Ly-49GB6 and Ly-49GBALB/c, only residue 246 interacts directly with class I and it does so at both sites 1 and 2 (Fig. 7⇓). 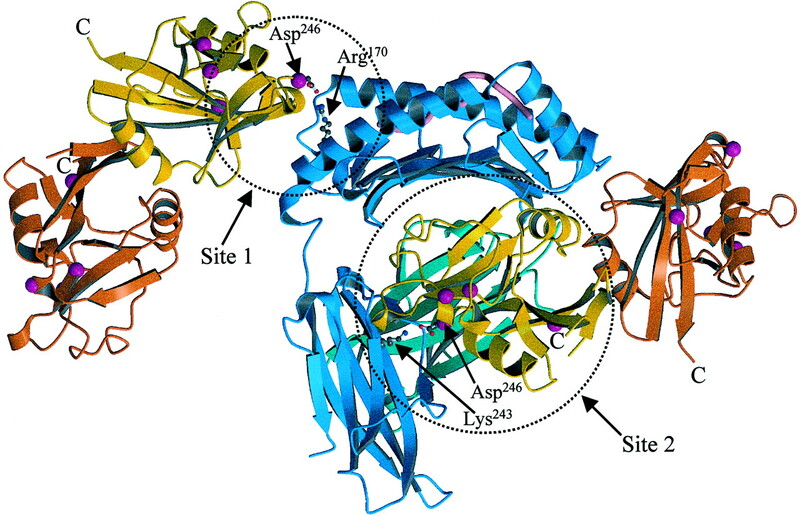 Ly-49A and Ly-49GB6 have aspartate at position 246 which forms salt bridges with class I residues Arg170 (site 1) and Lys243 (site 2) (Fig. 7⇓). Ly-49GBALB/c cannot make either salt bridge due to the Asp246→Gly substitution. Molecular modeling suggests that this loss cannot be compensated for in site 2. Consequently, if Ly-49 Asp246 interaction with Lys243 at site 2 is important for receptor engagement, Ly-49GBALB/c is predicted to recognize Dd and Dk more poorly, but this is not observed (Fig. 2⇑). At the site 1 interface, the Asp246→Gly substitution can be compensated for by side chain rearrangement of Asp244 as we proposed previously for interaction with Dk by the Ly-49G-related Ly-49W-activating receptor (37). The Asp246→Gly substitution creates space and enhances backbone flexibility. Both effects may increase the ability to adapt to potential ligands, thereby giving rise to a broader class I specificity as is observed (Fig. 2⇑). However, additional studies are required to determine the relative physiological importance of site 1 and site 2 in Ly-49G interactions with class I MHC ligands. Polymorphic Ly-49G residue 246 is located at the class I MHC ligand interface(s). A schematic diagram of H-2Dd (blue), β2-microglobulin (cyan), a bound peptide (pink), and two Ly-49A homodimers, representing site 1 and site 2 interactions, is shown. For clarity, each dimer is shown as yellow and orange monomers. In each monomer, CRD residues that differ between B6 and BALB/c alleles of Ly-49G are shown as magenta spheres. Of these differences, only residue 246 contacts the class I molecule. In Ly-49GB6, Asp246 is predicted to make the same class I ligand contacts as in Ly-49A, forming salt bridges to Arg170 (site 1) and Lys243 (site 2) of the H chain as depicted in ball-and-stick representation. In contrast, Gly246 in Ly-49GBALB/c is expected to alter Ly-49 contact at site 1 and site 2. One Ly-49G CRD polymorphic residue is not visible in the crystal structure; however, its C-terminal location (indicated by “C”) is not close to the class I interface. This figure was created with MOLSCRIPT (51 ) and Raster3D (52 ). We provide evidence that the BALB/c allele of Ly-49G recognizes the xenogeneic hamster target CHO. Ly-49GBALB/c and the activator Ly-49D may share undefined CHO ligand(s), or recognize different CHO ligands. It was reported that 4D11+ NK cells of B6 origin do not lyse CHO cells unless incubated with the 4D11 Ab, suggesting that Ly-49GB6 may recognize CHO ligands (38). In contrast, using the Ly-49WGB6 allele chimeric receptors expressed on RNK cells, we do not observe recognition of CHO cells, suggesting that the ectodomain of Ly-49GB6 is not capable of recognizing CHO ligands. A complication for the 4D11+ NK experiments described previously is that Ly-49A, and possibly other Ly-49 receptors also are recognized by the 4D11 Ab (39, 40), potentially obscuring which NK receptor(s) are recognizing CHO ligands. Ly-49D recognizes xenogeneic rat Con A blast targets from the F344 and LEW strains, but not from PVG (16). In contrast, we found that both B6 and BALB/c Ly-49G ectodomains recognize PVG, but not F344. These results suggest that Ly-49G and Ly-49D can recognize different rat ligands. Rat MHC molecules may be ligands for mouse Ly-49D (16), and it is possible that this is also the case for Ly-49G. The ectodomain of Ly-49GBALB/c recognizes LEW targets having the rat RT1l MHC haplotype, but not F344 targets that have the RT1lv1 MHC (Fig. 6⇑, A and B). LEW and F344 rats are genetically identical in RT1.A and RT1.B/D (classical class I and class II MHC) genes, but differ in RT1.C/E/M regions of the rat MHC (41, 42). If Ly-49GBALB/c recognizes a rat MHC ligand, then a nonclassical molecule encoded in the RT1.C/E/M region of the RT11 haplotype may be a ligand. Rat nonclassical class I molecules encoded in the RT1.C/E/M region of RT1l can activate or inhibit rat NK cell function (43, 44, 45). The significance of xenoantigen recognition by Ly-49 receptors is not understood but could relate to interspecies predation and resistance to pathogen passage across species (16, 46). Allelic exclusion, where only one or the other allele of Ly-49 genes is expressed in the majority of F1 NK cells, has been observed (47, 48, 49, 50). The functional significance of Ly-49 allelic exclusion is unknown. However, should Ly-49 alleles have distinct ligand specificities, then Ly-49 allelic exclusion may enhance the number of distinct NK subpopulations with different ligand specificities in heterozygous animals. Our demonstration that Ly-49 alleles can show different specificity patterns for mouse class I proteins and xenogeneic ligands is consistent with this possibility. Ly-49 polymorphism and allelic exclusion may operate together to augment NK cell functional diversity using a limited set of receptor genes. We thank Dr. Mary Nakamura (University of California, San Francisco) for RNK-16 cells and helpful advice. We also thank Dr. Andrey Shaw (Washington University) for the BSRαEN expression vector. ↵1 This work was supported by operating grants from the Canadian Institutes for Health Research (to K.P.K. and B.H.). E.T.S. is supported by an Alberta Heritage Foundation for Medical Research (AHFMR) studentship. B.H. is an AHFMR Scholar and K.P.K. is an AHFMR Scientist. ↵3 Abbreviations used in this paper: ITIM, immunoreceptor tyrosine-based inhibitory motif; ITAM, immunoreceptor tyrosine-based activating motif; CRD, carbohydrate recognition domain; CHO, Chinese hamster ovary; PA/PG, soluble protein A and protein G; ADCC, Ab-dependent cell-mediated cytotoxicity.